First, Khrushchev used his shoe to bang on the table at the UN in 1960. 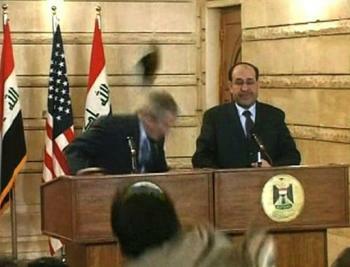 And now, Bush was nearly nailed by a shoe in the head by a journalist in Iraq, who shouted, "Here's farewell, you dog." Points for Bush for ducking in time. Points for the Iraqi journalist for using the insult "you dog." I really must use that insult more often. What’s tragic is that Jon Stewart and Stephen Colbert are off for the rest of the year and won’t be back on air till January. Now that’s invective I can believe in! So how did that turn out? You left out the ending. As is the way of things in the region, in 1844 a later Sultan rebelled against Russian rule, joined up with Imam Shamyl but was also forced in the end to beg for Russian pardon by 1859. It’s a tough neighborhood. After the fall of the czar, it seems to have passed back and forth between Azerbaijan and Georgia a bit before the Bolshies assigned the area to Azerbaijan in 1921. There’s a nice national park over in that corner of Georgia now (Lagodekhi), and I hope to hike up into the mountains this summer.